The Columbus Blue Jackets finally made the playoffs. 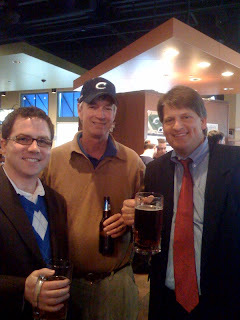 Before the game, we dropped in at Boston's and ran into our friends Michael and Chuck. Bottom line: the Columbus Blue Jackets got swept in the first round of the Stanley Cup playoffs by the Detroit Red Wings. 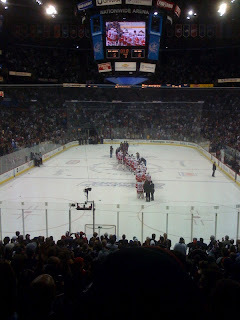 The score of the clinching final game in Nationwide Arena was 6-5. 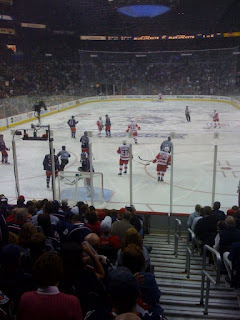 The Redwings scored a power play goal with 46.6 seconds to go in the game in the aftermath of a disputed penalty call. Lisa and I were there, and yes, we and all the onlooking Blue Jackets fans were disappointed. But anyone who was in attendance will agree that is far from the whole story. First, despite the sweep, it was important for the Jackets to play a respectable game and they certainly did that coming back twice from two goal deficits before bowing to the reigning Stanley Cup champions. In the first 2 1/2 games , the Jackets, experiencing their maiden playoff voyage, had difficulty adjusting to the ramped up intensity. They were starting to get the hang of it toward the end of the series and they easily could have won game 4 with better luck. What was particularly significant about this game is that it was really the first time EVER that a rambunctious ear-splitting emotional professional sports crowd has surfaced in Columbus. Oh I know, the Jackets have been toiling in Columbus for nine years, but I had never seen a Columbus sports crowd react in the passionate manner like Browns and Steeler fans do. By the same token, even the actions of the fans in throwing bottles onto the ice (it was not near as bad as the infamous "bottle game" the Browns played a few years back which I also attended) after the questionable penalty call was all part of the coming of age of Columbus professional sports. I hope this passion can be sustained; it was really fun to be part of it.